Fjords of Tierra del Fuego: Our Patagonia cruise tours follow the fjords of the southern edge of Tierra del Fuego highlights the stunning, natural beauty of Patagonia and several of its most important historical sites. 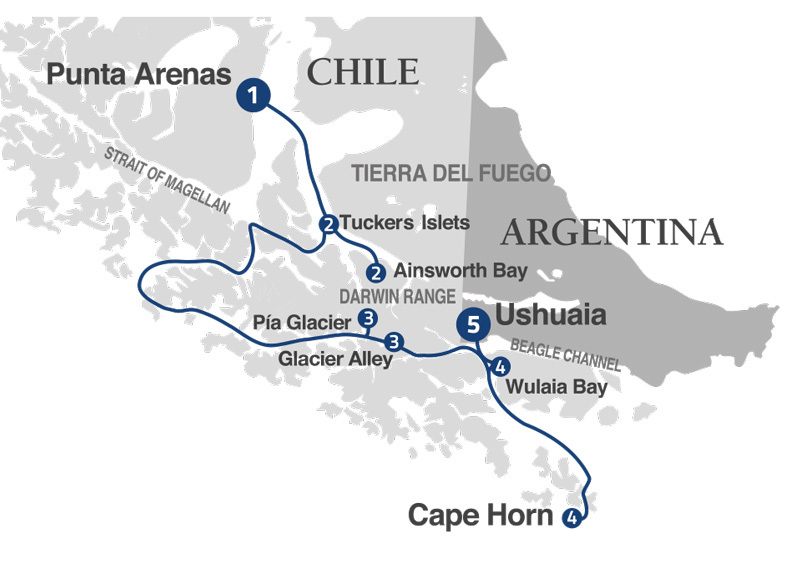 Whether you are sailing aboard M/V Ventus Australis, this four-day journey includes visits to wildlife rich Ainsworth Bay, massive Pia Glacier and Glacier Alley, as well as mystical Wulaia Bay and the legendary Cape Horn. For more information about our Patagonia cruise tours ! Fjords of Tierra del Fuego: Our Patagonia cruise tours follow the fjords of the southern edge of Tierra del Fuego highlights the stunning, natural beauty of Patagonia and several of its most important historical sites. Whether you are sailing aboard M/V Stella Australis, this four-day journey includes visits to wildlife rich Ainsworth Bay, massive Pia Glacier and Glacier Alley, as well as mystical Wulaia Bay and the legendary Cape Horn. For more information about our Patagonia cruise tours, contact us!